Xposé is one of the biggest fashion TV shows in Ireland at the moment so when they decided to create a sister magazine of course it was set to be huge! I was an avid reader from the first edition so you can imagine my excitement when they contacted me to be a part of the bloggers section in the March issue. Every month they pick a selection of Irish bloggers and give them a particular theme to style according to their own taste. Being March and the month of Mother’s Day, my theme was to pick an item from my Mother’s wardrobe that I borrow or lust after. My Mother has always been my inspiration. People often ask who my style icons are and whilst I have a long list of celebrities whom I admire, my Mother is my number one. 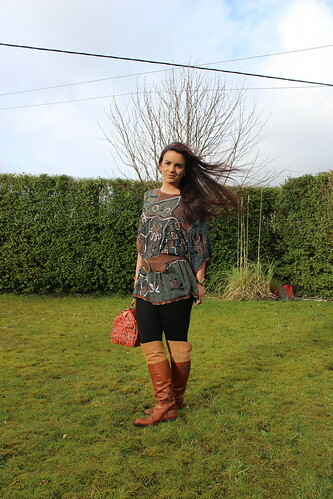 I chose this vintage beaded tunic which I simply adore. It is the perfect addition to add glamour to an otherwise casual outfit, in this case being plain black leggings and a pair of over the knee boots from Tommy Hilfiger. I also added some orange accessories to highlight the colours in the top. Hope all you Mother’s out there had a fantastic Day and my thoughts are with any of you who did not get to celebrate with your own Mum for one reason or another! Gorgeous! 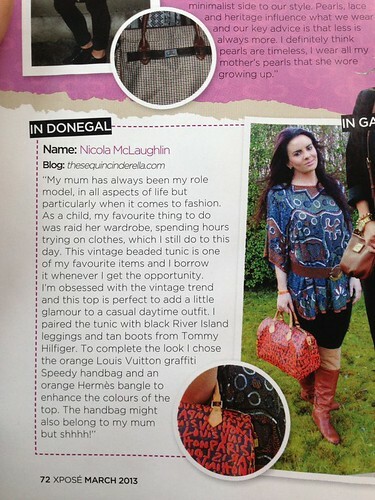 Your mum must be a very stylish lady. looking awesome dear, lurv ur top and boots. thanks for stopping by! 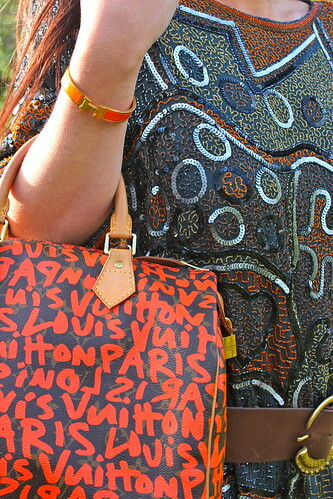 you look so gorgeous, love your top and the LV bag! Really congrats and nice outfit. Have a great day. i love this outfit! I just found your blog and I love that! congrats on d feature, and ur top looks so hot ! Congrats on the feature! I love your bag! Gorgeous look Nicola, I love the boots. Looove the tunic, so nice! And the boots and belt go so well with it!